So, the History Channel’s “The Bible” series is a rehash of this longstanding tradition. I watched several sections of the 10-hour event and I must say it’s staggering. As I expected, the main characters were still overtly blondish, White Anglo-Saxons and blue-eyed. Interestingly, key leading characters also had British accents (something filmmakers do to communicate one of two things: one, that these characters are special, more intelligent, and central to the story’s main development. Or two, to communicate that the characters are cold, aristocratic, and/or potentially evil. Star Wars is a great series for this. Apparently, so is The Bible). One example of this is when the Romans leave it to the Hebrews to determine whether Jesus should be crucified or not. The hand-wringing Pontius Pilate looks at the Jews as somewhat batty…but acquiesces. Now…as the first official “European” character in Biblical history, the Roman Pilate in film becomes a political figure. He, and all is nuanced facial expressions and reservations, provides a kind of statement about whiteness. From a Black Gnostic vantage point, however, such representations as the History Channel’s The Bible do several things: first, they reaffirm people’s faith and provide them a sort of global ritual of rehearsing The Resurrection, but referenced solely from a self-absorbed all-White imaginary. Second, they reify the visual memory of narratives and parables that may be more effective when left to the imagination rather than acted out (this tends to privilege the filmmakers’ worldview rather than leave it open to interpretation). Third, they crystallize a historical focus on biblical narrative that distracts from the point: it was never meant to be about Bible’s stories, the characters, or the imagery. The point is you. It always was. The more attention paid to historical specificity and special effects distracts us from the our own spiritual progression as we fixate our attention on what may or may not have occurred 2,000 years ago. The relevance of the past is the present. And the importance of now is realizing one’s divine capabilities. And fourth, continuing with the notion of distraction, the narrative story of say…Easter, distracts from some of the astronomical aspects of the story’s progression. 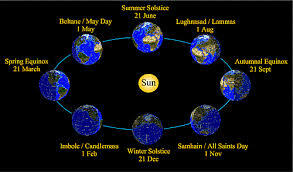 A Black Gnostic would account for the vernal equinox’s role, acknowledging the symbolic importance of the Sun’s visual ascent “upward,” or rather that of the resurrection–or expansion–of the sun (higher consciousness) after approximately three days of imperceptible movement. In essence, the stories this series portrays have a wide variety of meanings to Black Gnostics, very few of which are dealt with by conventional biblical literalism. Maybe one day my grandchildren will watch such stories with Africans more prominently figured in the narrative. Or, it will be a meditation on perceiving one’s consciousness as the rising sun in nature (the most powerful force in the macrocosm, as consciousness is within). Either way, the legacy of Charlton Heston needs to be replaced in our annual viewing ASAP, because truth, in all its myriad and nuanced ways, has had few opportunities to reach mainstream TV viewing…so ‘word of mouth’ it is! ~ by Lord Amaru on April 1, 2013. Dr. Johnson…I enjoyed your blog article very much. I didn’t watch The Ten Commandments, I haven’t in years. I can no longer stomach it for a lot of reasons. You offer several layers or angles one might consider around this story of the commandments and of Easter. I agree, it is very much about “you” “The relevance of the past is the present. And the importance of now is realizing one’s divine capabilities.. “. Thankfully, I do understand that it is the spirit and strength manifested within, that powers through for divine wisdom, growth and collective benefit. Just lettin you know…all are not lost.